Development: The rhodopsin based effector, CatCh was inserted at the ATG site of the HCN4 gene in the BAC RP23-281H22 (CHORI) through homologous recombination. The resulting recombinant BAC was injected into the male pronucleus of fertilized oocytes which were then implanted into pseudo pregnant females. Resulting offspring were screened for the presence of the transgene (founders). Colonies were established from each founder and tested for expression. Description: The rhodopsin based effector, CatCh is expressed under control of the HCN4 promoter, directing expression to the SA node and the AV node of the heart and the nervous system (brain and spinal cord). 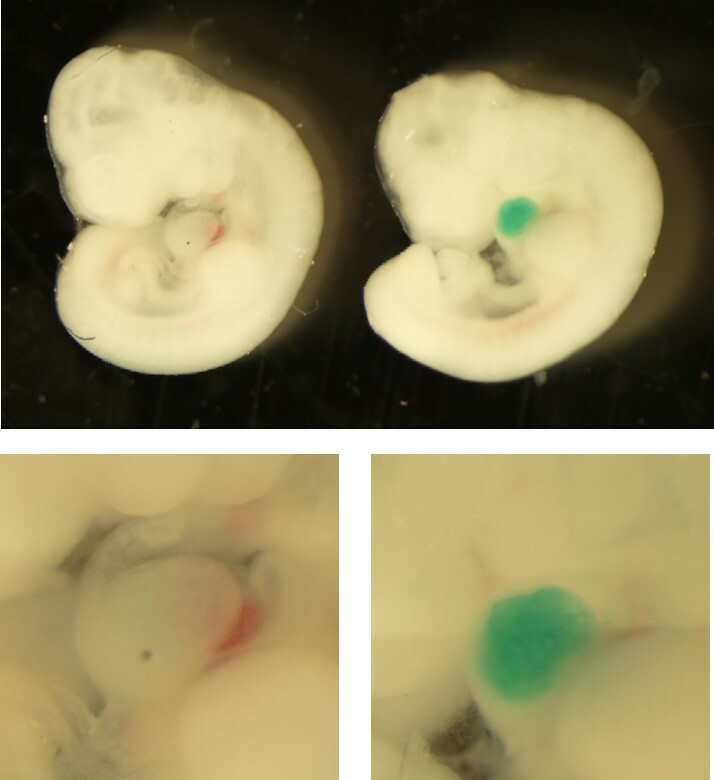 Expression is observed in the developing 10.5 and 13.5 dpc heart, neonates and adult mice. An internal ribosome entry site (IRES) allows for co-expression of lacZ as a visual indicator of expression patterns. The heart rate of the HCN4-CatCh-IRES-lacZ mouse can paced by laser stimulation of the SA node in the adult (data not shown). Additionally, lacZ staining shows the extent of the expression of the transgene in all stages of development. 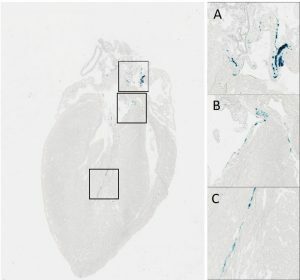 LacZ staining of the heart of PN4 neonates, followed by tissue clearing, shows expression within the intricate network of HCN4 expressing, specialized conducting cells lining both the left and right ventricles as well as the SA and AV nodes. 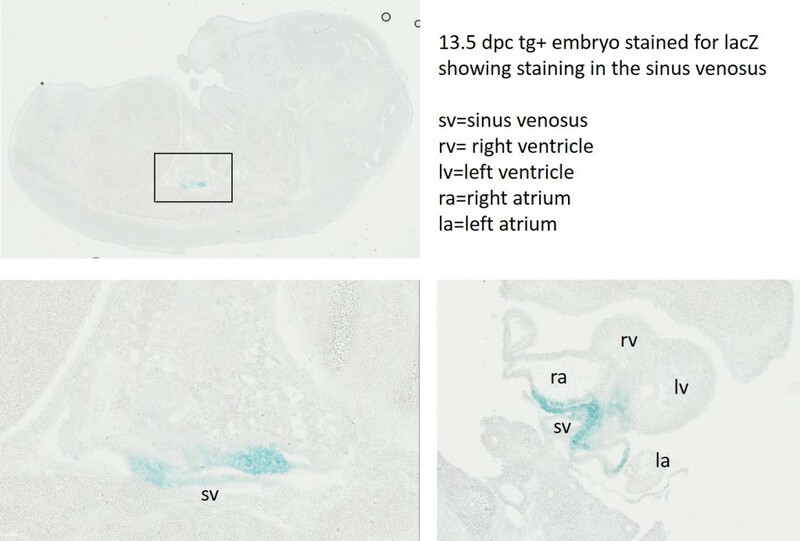 Line 1 13.5dpc embryo showing lacZ staining in the sinus venosus. So as to appropriately acknowledge and credit the scientists who have produced the HCN4-CatCh-IRES-lacZ mouse strain, it is expected that you will include these individuals in any publication that is submitted prior to the initial publication of this line from the Kotlikoff laboratory. 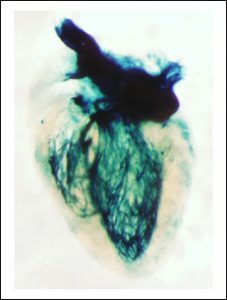 The mouse strain HCN4-CatCh-IRES-lacZ was developed by CHROMusTM which is supported by the National Heart Lung Blood Institute of the National Institute of Health under award number R24HL120847.